A team of California scientists have developed the world’s first portable brain scanner, and it may soon be able to “read a person’s mind,” playing a major role in facilitating medical breakthroughs. “This is very exciting for us because it allows us to have a window into the brain. We’re building technology that will allow humanity to have access to the human brain for the first time,” said the project’s leader, Phillip Low. KGTV reports that the device, created by San Diego-based NeuroVigil, and dubbed the iBrain, fits over a person’s head and measures unique neurological patterns connected to specific thought processes. Low says the goal is to eventually have a large enough database of these brainwaves that a computer could essentially read a person’s thoughts out loud. One person who has already tried out the iBrain is famed physicist Dr. Stephen Hawking. “We’d like to find a way to bypass his body, pretty much hack his brain,” said Low. This past summer, Low traveled to Cambridge, England, where he met with Hawking, who was asked to think “very hard” about completing various tasks while wearing the device. NeuroVigil says the device could be used at home by individuals and worn during sleep. It comes equipped with a USB port for transferring the recorded data to a local computer. 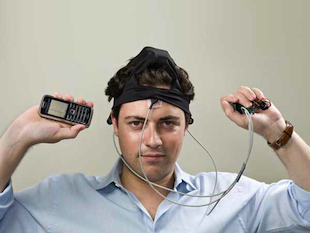 Beyond so-called mind reading, the device has potential medical applications, such as enlisting the iBrain to help doctors prescribe the correct levels of medication based on a person’s brainwave responses. “This is the first step to personalized medicine,” Low said. 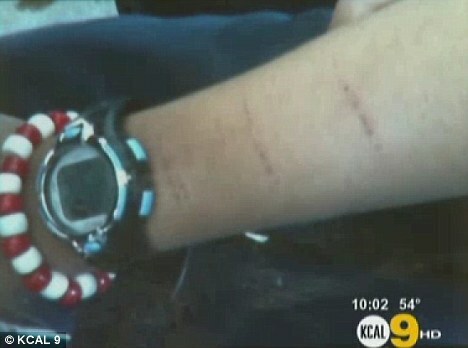 More than a dozen 5th grade students mutilated themselves during class using the blades in pencil sharpeners. A student is believed to have dislodged the blade and passed it around class in the mass-cutting while a substitute teacher was not paying attention. Several children were taken to hospital, where one child still remains after the incident in Los Angeles last week. The Los Angeles Unified School District confirmed the incident happened at the Normandie Avenue Elementary School, reports the Huffington Post. ‘I think it was something about the bullying. They got all crazy and started cutting themselves.’ a classmate, who witnessed the cutting, told CBS LA. The class was interviewed by the district officials but it is not yet known if the students were victims of bullies. Pia Escudero, who runs LAUSD’s mental-health program, told CBS2 that this was typical elementary-school behavior. ‘We see a lot of behavior that is similar to this, children seeking help,. Attention-seeking, suicide behavior — or doing things that aren’t healthy,’ she said. The school is located within a relatively low-income neighborhood of South L.A, with a demographic which is about 70 percent Latino and 30 percent black. The report by the Royal Society, the UK’s national academy of science, says that while the rapid advance of neuroscience is expected to benefit society and improve treatments for brain disease and mental illness, it also has substantial security applications that should be carefully analysed. The report’s authors also anticipate new designer drugs that boost performance, make captives more talkative and make enemy troops fall asleep. “Neuroscience will have more of an impact in the future,” said Rod Flower, chair of the report’s working group. “People can see a lot of possibilities, but so far very few have made their way through to actual use. A growing body of research suggests that passing weak electrical signals through the skull, using transcranial direct current stimulation (tDCS), can improve people’s performance in some tasks. 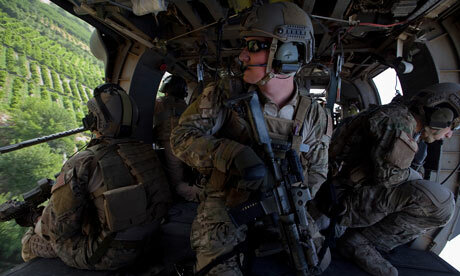 One study cited by the report described how US neuroscientists employed tDCS to improve people’s ability to spot roadside bombs, snipers and other hidden threats in a virtual reality training programme used by US troops bound for the Middle East. “As a scientist I dislike that someone might be hurt by my work. I want to reduce suffering, to make the world a better place, but there are people in the world with different intentions, and I don’t know how to deal with that. Research with tDCS is in its infancy, but work so far suggests it might help people by boosting their attention and memory. According to the Royal Society report, when used with brain imaging systems, tDCS “may prove to be the much sought-after tool to enhance learning in a military context”. One of the report’s most striking scenarios involves the use of devices called brain-machine interfaces (BMIs) to connect people’s brains directly to military technology, including drones and other weapons systems. “Since the human brain can process images, such as targets, much faster than the subject is consciously aware of, a neurally interfaced weapons system could provide significant advantages over other system control methods in terms of speed and accuracy,” the report states. The authors go on to stress the ethical and legal concerns that surround the use of BMIs by the military. Flower, a professor of pharmacology at the William Harvey Research Institute at Barts and the London hospital, said: “If you are controlling a drone and you shoot the wrong target or bomb a wedding party, who is responsible for that action? Is it you or the BMI? Another tool expected to enter military use is the EEG (electroencephalogram), which uses a hairnet of electrodes to record brainwaves through the skull. Used with a system called “neurofeedback”, people can learn to control their brainwaves and improve their skills. Research last year by Scott Grafton at the University of California, Santa Barbara, drew on functional magnetic resonance imaging (fMRI) scans to measure the flexibility of brain networks. They found that a person’s flexibility helped predict how quickly they would learn a new task. The GENI project is gathering momentum and is endorsed by the Dalai Lama, Archbishop Desmond Tutu, Sen. James Jeffords (I-VT) and Noel Brown (North American Director, United Nations Environmental Program), the United Nations and by the governments of Canada New Zealand, Switzerland, and China, among others. The dark horse of the New World Order is not Communism, Socialism or Fascism: It is Technocracy. The development and implementation of Smart Grid technology in the U.S. – reinventing the electrical grid with Wifi-enabled digital power meters – is proceeding at breakneck speed. Although Smart Grid is the result of years of government planning, the recent kickoff was made possible through massive “green” grants that were quietly included in President Obama’s economic stimulus package starting in 2009. These lucrative grants have drawn in a host of corporate players, from utility companies to digital meter manufacturers to control software vendors. Global companies like IBM, GE and Siemens are putting their full effort behind the “build-out” that will consolidate all of America into a single, integrated, communication-enabled electric delivery and monitoring system, collectively called Smart Grid. Proponents of Smart Grid claim that it will empower the consumer to better manage his or her power consumption and hence, costs. The utility companies will therefore be more efficient in balancing power loads and requirements across diverse markets. However, like carnival barkers, these Smart Grid hocksters never reveal where or how SmartGrid came into being, nor what the ultimate endgame aims to achieve; perhaps most of them have no idea either, but simply repeat the mantra as if they know what they are talking about. In SmartGrid: The Implementation of Technocracy?, I revealed the background of both Technocracy and Smart Grid, and most importantly, the links between them. Smart Grid is born out of Technocracy and not the other way around. 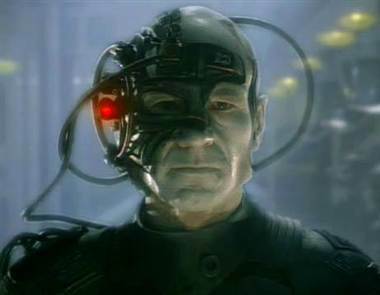 Technocracy is a totalitarian system of government where scientists, engineers and technicians monitor and control all facets of personal and civic life – economic, social and political. Herein lies the real danger: Who are these unelected controllers and why should anyone believe that they would be benevolent dictators instead of tyrants? Americans are a freedom-loving people who would certainly reject Technocracy’s stealth takeover, if only they were aware of it. Indeed, Americans did pointedly reject Technocracy in the 1930’s! Facebook is at the centre of another privacy row after bringing in facial recognition technology to automatically identify users in pictures. The world’s leading social network has begun rolling out new technology that automatically identifies and ‘tags’ people in photos uploaded to the website. The feature has been expanded from a limited test run in the U.S. to be widened across all of the States and ‘most countries’, Facebook said on its official blog yesterday – and, by default, it’s turned on. 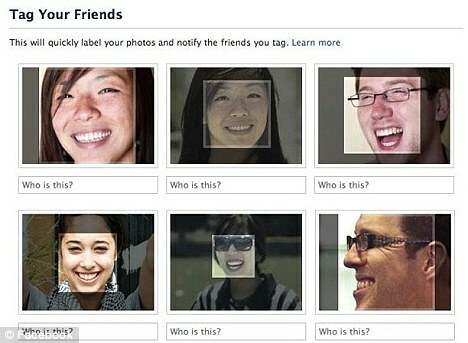 Facebook’s ‘Tag Suggestions’ feature is designed to speed up the process of labeling friends in photos posted on Facebook. If a friend ‘tags’ you in one photo, the technology will automatically scan your face and then try and find matches among all their pictures. It will then suggest that they ‘tag’ these photos of you as well. The sudden implementation of the feature, without warning, has sparked concerns among privacy campaigners. Daniel Hamilton, director of privacy campaign group Big Brother Watch, said: ‘Facebook users will rightly be alarmed to hear that their private information will be used in this way. This is yet another nail in the coffin for online privacy. And not all commentators are convinced that opting out will do you any good. She also warns: ‘Facial recognition technology will ultimately culminate in the ability to search for people using just a picture. Internet security consultant firm Sophos first reported the change yesterday, after Facebook users reported that the site had enabled the facial recognition option in the past few days without giving users any notice. ‘Yet again, it feels like Facebook is eroding the online privacy of its users by stealth,’ wrote Graham Cluley, a senior technology consultant at Sophos, in a blog post. Facebook, which announced in December that it planned to introduce the service in the U.S., acknowledged that the feature was in fact now more widely available. When asked about the Sophos blog post, a spokesman for the company conceded that they ‘should have been more clear with people during the roll-out process’. They made clear that tag suggestions would only be made to friends of those pictured, and that the users can switch off the feature to stop their names being put forward. But Marc Rotenberg, President of the non-profit privacy advocacy group Electronic Privacy Information Center, noted that other companies had offered more users more control when implementing facial recognition features. He highlighted Apple’s iPhoto software, which let users decide whether or not to use the technology with their personal photo collections. Facebook’s technology, by contrast, operates independently, analysing faces across a broad swathe of newly uploaded photos. Mr Rotenberg said such a system raised questions about which personally identifiable information, such as email addresses, would become associated with the photos in Facebook’s database. 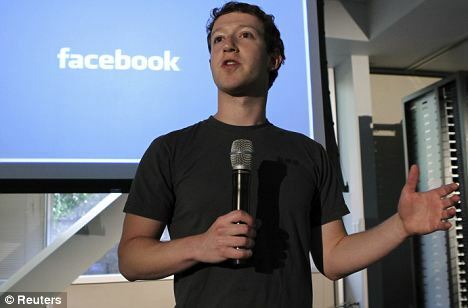 He also criticised Facebook’s decision to automatically enable the facial-recognition technology for Facebook users. ‘I’m not sure that’s the setting that people would want to choose. A better option would be to let people opt in,’ he said. A serious concern intially expressed over Facebook and other social networks is the ability to publish photographs online without any express permission from those pictured. Although it is possible for users to ‘de-tag’ themselves, those pictured cannot demand photographs removed. The new feature will raise fears among those who have photographs they would prefer do not come to light. Sarah Jacobsson Purewal suggests as well as switching off facial recognition that users post random pictures of trees and stuffed animals and tag them with their name. A spokesman from Facebook said: ‘We launched Tag Suggestions to help people add tags of their friends in photos; something that’s currently done more than 100 million times a day. It emerged last week that Google recently decided to hold back a similar application that would have let someone snap a picture of a person’s face using a smartphone, then use the internet to find out who that person is. Google’s executive chairman Eric Schmidt told a conference he believed it was the first time his company’s engineers had completed a project and shelved it for privacy reasons, CNN reported. Last year the Electronic Privacy Information Center filed a complaint about Facebook’s privacy practices with the U.S. Federal Trade Commission, which Mr Rotenberg said was still pending.